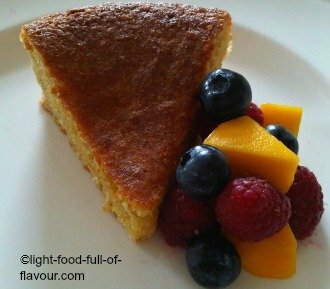 I serve this divine lime and almond cake either as a dessert after a meal – with lots of berries and mango - or as an afternoon cake with a cup of tea or coffee. There is lots of ground almond and very little flour in this cake - I use organic white spelt flour. It’s a cake so there is butter and sugar involved, but almonds are good for you and organic spelt flour is so much better than the ordinary plain flour sold in supermarkets. And I am using xylitol in place of sugar these days. Xylitol looks and tastes like sugar but has very little effect on raising your blood sugar. Tip: If you can only get hold of waxed lime fruits, make sure you scrub them really well with a clean scrubbing brush. And don’t be too forceful when grating the zest. You only want the very outer layer of the fruit, not the bitter pith, the inner white part. 1. Pre-heat the oven to 180C/350F/ gas mark 4. Line a 20cm-diameter cake tin with a cake tin liner, or lightly grease the tin with butter and dust with a bit of ground almonds. Place the eggs, sugar and vanilla extract in a bowl. Use an electric whisk, or whisk by hand, to beat the eggs and sugar together until pale and light. Use a large spoon and mix in the butter. 2. Place the ground almonds in another bowl and sieve the spelt flour and baking powder into the bowl. Add the lime zest, mix together and add this to the bowl with the eggs, sugar and butter. Mix it all together quite quickly. 3. Pour the mixture into the prepared tin and place the tin in the oven. Bake the lime and almond cake for approximately 30 minutes, until nicely browned. Allow the cake to cool in the tin.